Bishop of Antioch, martyr in the Decian persecution, died in prison. Irish monk, immediate successor of St. Columba as abbot of Iona. Baithen died sometime between 598 and 600. There are at least two saints of this name venerated at Rome. 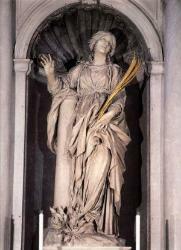 Legendary virgin and martyr, first mentioned in the early seventh century. Alleged to have died in the third or fourth century, but date is uncertain and place of martyrdom varies. Mentioned in the lists of apostles in the Synoptic Gospels and in Acts, thought to be identical with Nathaniel (mentioned only in the Gospel of John). A runaway slave who became the wife of King Clovis II. Upon widowhood, she founded monasteries and proved herself a capable regent. She died in 680. 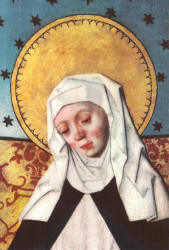 Cistercian abbess born in Portugal in 1424. The daughter of a nobleman, Beatrix accompanied Princess Isabel of Portugalto the court of Spain. Anglo-Saxon, monastic founder, d. 690. St. Benedict was a Goth, served in the Frankish court, then became a Benedictine monk. His monastery of Aniane was the model for monastic reform in France and the Empire. He died in 821. Also known as Benedict the Moor. Born in Italy to Christian slaves from Ethiopia, St. Benedict joined an association of hermits, and when that was dissolved, became a Franciscan Recollect. Known as 'Patrick's psalm-singer,' Irish missionary, musician, bishop, legislator, d. 467. A disciple of St. Kevin. Abbot of Cluain Coirpthe, now called Kilbarry or Termonbarry in the saint's honor. 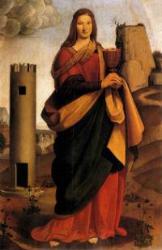 St. Berach died in 595. 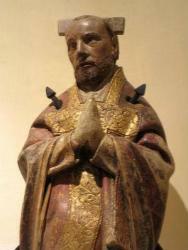 Abbot of Hautvillers, founder, stabbed to death by one of his monks in 696. Soldier, monk, abbot, Archbishop of Vienne, d. 842. Italian hermit, monastic founder, d. 1348. Archdeacon of Aosta, preacher, founder of two hospices for travelers in dangerous Alpine passes (now named the Great St. Bernard and Little St. Bernard, after him), d. 1008. Benedictine abbot and martyr. 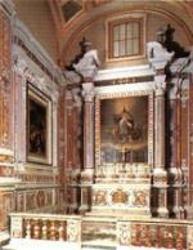 A member of the royal house of France, he became abbot of Monte Cassino, in Italy, in 856. 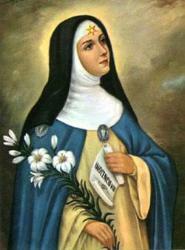 Virgin, also called Mary Bertilla. She was born in Brendola, in northern Italy. A member of the Congregation of Teachers of St.
Monk living under the Rule of St. Columban, missionary to the Morini, monastic founder, abbot of St. Omer, d. about 709. Converted to Christianity from paganism, entered the monastery of Luxeuil under the Rule of St. Columban, became abbot of Bobbio, was staunchly anti-Arian, d. 639 or 640. Welsh, said to have been educated at Bangor and, after ordination, to have become a missionary. 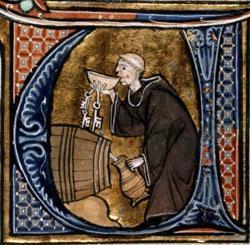 Abbot of Clynnog, and uncle of St. Winifred. Died perhaps in 660. Confessor, first Bishop of Dorchester, Apostle of Wessex, d. 650. 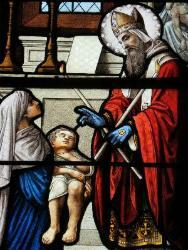 Bishop of Sebaste, martyred. about 316. Nephew of St. Cathan. Blane studied in Ireland under SS. Comgall and Kenneth, became a monk, went to Scotland, became a bishop of the Picts, died 590. Irish monk, martyred at Iona in about 835. In Latinized form, he is sometimes called Florentius. His life was written in Latin hexameter by Strabo. Crusader and hermit, also called Beuvon. Bobo was a knight of Provence, France, who fought against the invading Saracens and then became a hermit. 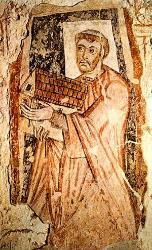 Abbot of Melrose, renowned for prophetic gifts, taught St. Cuthbert. St. Boisil died in 664. Or Botolph. Founder and abbot of Icanhoe, d. about 680. Bishop of Saragossa, hagiographer, friend of St. Isidore of Seville. 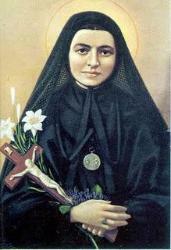 St. Braulio died in about 651. Fifth-century Irish missionary to Wales and a contemporary of St. Patrick. St. Brendan of Ardfert and Clonfert, also known as Brendan the Voyager. Monastic founder, d. 577. About half of the article is devoted to St. Brendan's famous voyage. Mother of 8, widow, visionary, founder of the Brigittines. Celtic monk and priest, companion of St. Iltud. Brieuc died in about 502. Discusses several saints of this name. Bishop of Segni, reformer, Benedictine abbot, author of commentaries on Scripture, d. 1123. Courtier, monk, missionary archbishop, hagiographer, martyr. Called the Second Apostle of the Prussians.